Many devices are added weekly to the Official LineageOS 15.1 Supported devices list. Starting from LineageOS 15.1, LineageOS team has made stringent device support norms, which ensures that almost every important piece of hardware present on a phone MUST be in a working state on an OFFICIAL LineageOS 15.1 build. Which clearly means that users will enjoy a stock like upgrade experience on OFFICIAL LineageOS 15.1 updates. Probably this could be one of the reasons why we don’t have many OFFICIAL LinegeOS 15.1 devices even after couple of quarter of Android Oreo source code made public. 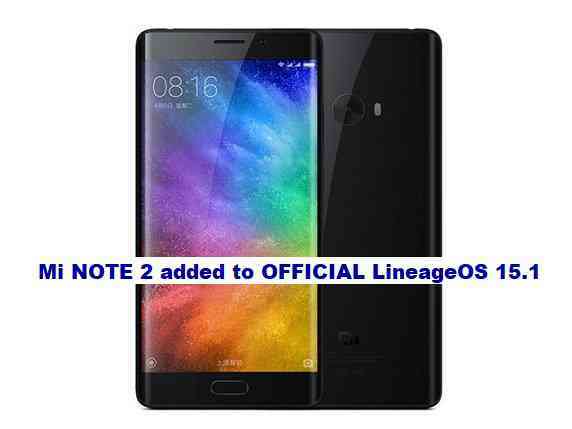 The Official build for Mi NOTE 2 is scheduled to generate an official lineageos 15.1 NIGHLTY build on Monday. Which means the weekly NIGHLTY builds will be available on Monday of every week for Mi NOTE 2. As always the LineageOS ROM does not come with pre-installed GApps (Google Applications) because of Copyright issues, so, you need an extra GApps for LineageOS 15.1 to be installed via a custom recovery. Also, this LineageOS 15.1 Oreo ROM does not come with built-in ROOT binary, hence you need the LineageOS 15.1 supersu ROOT binary to be installed after installing the LineageOS 15.1 Android Oreo 8.1 ROM. LineageOS has Attlasian Jira BUG tracking tool which you can use to raise a BUG ticket for the issue you face with proper description and debug logs, of course will help fixing the issue. File a JIRA ticket to the LineageOS maintainer for a BUG found by filling required data. You need to register and login to use this tool. Fill all the build details, last known good build and the build date where you see the issue, project version etc. If you need some help or have something to say on this, then login and and comment on this post or in the Mi NOTE 2 forum.